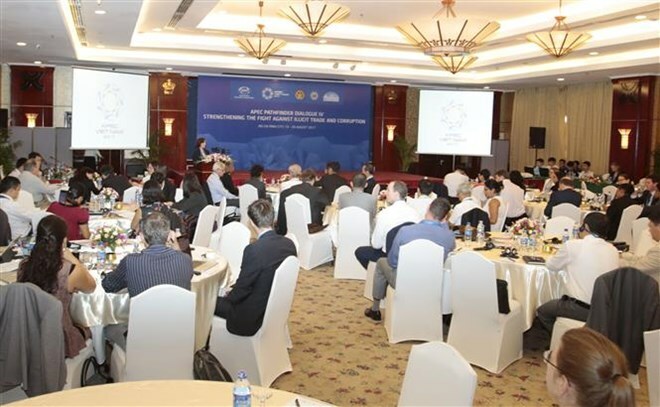 HCM City (VNA) – Working groups and sub-committees of the Asia-Pacific Economic Cooperation (APEC) will continue discussions on issues of their charge in Ho Chi Minh City on August 21 as part of the third APEC Senior Officials’ Meeting (SOM 3). There will be meetings of the Health Working Group, the Emergency Preparedness Group, the Investment Experts’ Group and the Market Access Group. Besides, officials from APEC member countries will talk matters regarding the automotive and chemical sectors, customs procedures, standards and conformance, life sciences innovation, anti-corruption, electronic commerce, and illegal logging. The SOM 3 and related meetings brought together around 2,600 delegates from 21 APEC member economies. Slated to last until the end of the month, the event features 75 meetings, seminars, and dialogues involving four committees and dozens of working groups of the APEC. In the Mekong Delta city of Can Tho, apart from meetings on policy partnership on food security, ocean and fisheries, the Food Security Week will feature an exhibition on agriculture and advanced agro-production technologies on August 21. APEC is the Asia Pacific region’s premier economic forum. The primary goal is to support sustainable economic growth and prosperity in the region.